There is a popular believe that everything is available on line. 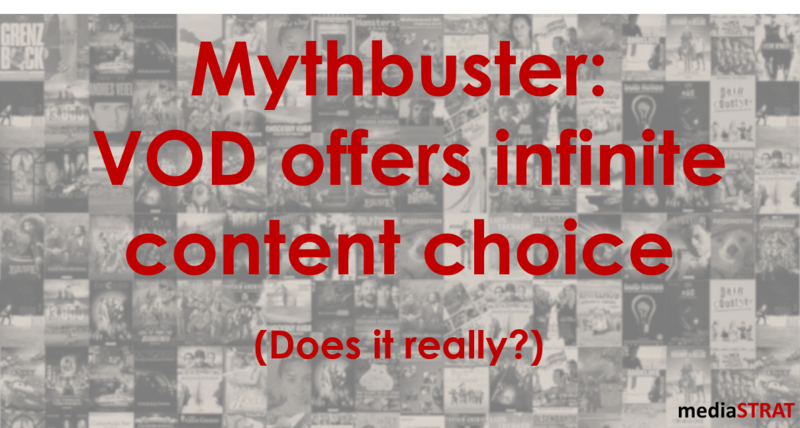 The sheer magnitude of content accessible through the different VOD services (Add, Transaction, Subscription, Free) seems to prove the point but is it the really the case? To limit the scope, the purpose is not to deep dive in the fascinating topic of regional licensing or windowing but to focus on the reality of viewer consumption and the basic economics of a VOD service. The key to success: More or less content? The early dream of VOD being an infinite repository of content from all genres and all countries that one could easily access from everywhere did not come true at least for the time. Looking at the content line up of the VOD services overtime shows an inverted gaussian curve. They originally grew to multiple thousands or even tens of thousands of titles before rationalizing their offering due to a combined effect of search for profitability and loss of distribution licenses. More recently at least S-VOD services looking to propose more local content and reduce churn amongst long time subscribers are growing their title offering substantially. Granular T-VOD consumption figures show that up to 70% of the rented titles are currents (available a few months after theatrical release) and only 30% libraries (about 2 years after). Even more a vaste majority of theses rents are made in the first 4 weeks after their T-VOD release. Consumers adopt Electronic Sales Through (EST – Buy instead of rent for T-VOD) not only for the psychological benefit of owning a title or collecting them especially for franchises but to a large extend because often EST gives them earlier access to content. EST being the first home entertainment window after theatrical release. The effect of the promotional marketing dollars is still lasting and for viewers preferring to watch the movies in the comfort of their home every week counts. VOD services look for ways to increase consumption of back catalog and long tail content. There is plenty of it, the revenue share model is much more appealing compared to current premium studio content but there is a catch. Despite improving automated workflows preparing a title for VOD distribution (ingest, encoding, metadata, eventual localization) and keeping it on a server for a very low number of views is in most cases not financially viable. Too many titles also complexify search and recommendation. Even assuming one can easily clarify the VOD distribution rights situation (which is not the case), the deeper one goes in the libraries the more difficult it gets. Picking up a tape on a shelve or even worth a 35mm roll would require an incredibly high number of buys to recoup these costs. Worth of all assuming the special interest content you are looking for is actually available there is a significant chance that you will not to be able to watch it either because it is not licensed in your territory or simply because you will not be able to find it. Profitable tradeshow – the 35 hour race? previous post: Which Hulu could be a model for European S-VOD joined ventures?